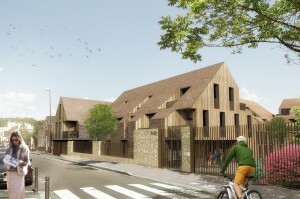 Just a stone’s throw from the famous Versailles castle, 60 flats are being built in the city’s historic fabric. 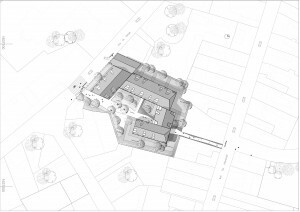 By reinterpreting the burrstones that cover the neighbouring houses and by outlining porosity within its block, the complex succeeds in its integration in a context whose heritage has been sublimated and updated. 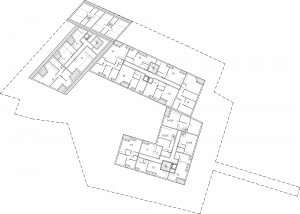 The five buildings fit into the continuity of neighbouring constructions whilst creating surprise with the contemporary reinterpretation of their volumes and materials. The burrstones that prevail in the neighbourhood give way in this complex to terracotta bricks, which take over their colour on the façade. On the roof, the tiles fit into this colorimetric continuity. Due to this uniformity, the five volumes integrate their roofs into double slopes in a continuous cloak, which is resolutely contemporary. Like its neighbours, the complex aligns with the street through one of its buildings. But the flats also invite the street to enter their plot through a generous footpath, which crosses the heart of the green block. The windows and loggias in the flats open up to this natural space, which also leads to the housing halls. Having a view of the trees whilst living in a historic district of Versailles, is the nec plus ultra that these accommodations offer their residents.